The Village of Hilton has created a military wall in recognition and in honor of all men and women who have served or are currently serving our country. Our wall displays pictures of military personnel and is on the first floor of the Community Center, 59 Henry St. If you would like to participate, please submit a photograph of your military person in uniform to the Village Office at 59 Henry St. 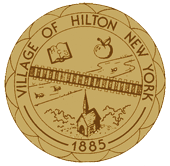 The Village of Hilton is pleased to announce that we are now accepting Visa, Mastercard and Discover credit/debit card payments. Customers who wish to use this method of payment will have to agree to pay a convenience fee to Nationwide Payment Solutions, who is the 3rd party vendor selected by the Village for this purpose. This fee will be 2.45% ($1.50 Minimum). A Flat Fee of $3.95 applies to all tax payments made using a Visa Consumer Check Card. Payments can be made either in person, by mail or by telephone. For more information, please call the Village Office at 392-4144.